Original rubber battery apron plugs shown in a 1965 GT350 Mustang Shelby. The first 300 or so '65 GT350 Mustangs (Shelby) originally had the battery relocated to the trunk of the car for weight distribution purposes. Because of this relocation, the battery tray was not needed up front in the normal location. This modification was made at Shelby American. 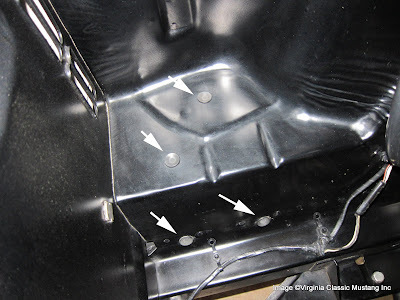 They actually went to the trouble of installing a unique rubber plug in the holes remaining in that front battery apron. This rubber plug was probably simply sourced as something that would serve the purpose. As far as anyone can determine, it was not a Ford part. As mentioned, it was just something that just happened to work. 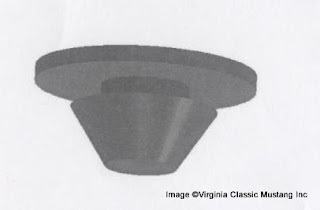 A drawing of an original 65 GT350 battery apron plug was made. As you can imagine, original plugs are usually missing from GT350's with the rear mounted batteries. If they are still with the car, they tend to be very hard and dry rotted. It is nearly impossible to find any originals if you have a car that needs them. 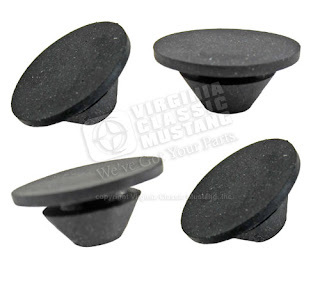 Samples of the reproduction 65 GT350 Mustang rubber battery apron plugs. I have always been somewhat fascinated by these little plugs, and the lack of their availability, so I decided to have them reproduced. A drawing was made from an original, and we just received the samples. The samples are, of course, much more pliable than the 47 year old originals. They fit just like the originals in that the flat top of the plug is drawn down once installed. We hope to have the production run done in 2-3 months. We will announce it here on the Virginia Classic Mustang Blog when they are available. Plugs installed in the battery apron of a 1965 GT350. 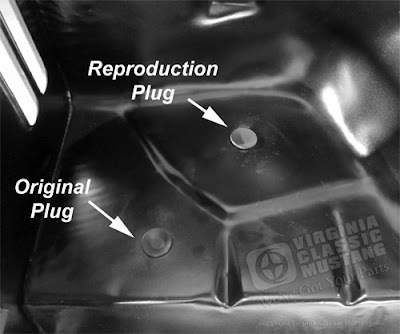 Note that the reproduction plug gets "drawn down" in the hole just like the original plug.